The recipe is based on one in Simon Hopkinson’s The Vegetarian Option. The book is great for sides, starters, flans and such, but not so good on whole vegetarian meals, which is something of a shame. Have a look here. Hopkinson makes a tomato jelly, which would be great, but I chanced it with something simpler – a tomato salad – mainly because I couldn’t find any vegetarian gelatine in the local supermarket. For the tomato salad I quartered and deseeded some cherry tomatoes, finely chopped a small amount of red onion, mixed them both with a splash of red wine vinegar, a little olive oil, salt and pepper, and a tiny amount of fresh red chilli, and set aside. For the goat’s cheese you need a soft, creamy goat’s cheese with no rind. In a small bowl mix it with a spoonful of creme fraiche, soured cream or even plain yoghurt, season with a little pepper, stir in a little olive oil and mix t get a slightly softer, creamier ‘cheese’ that can be spooned easily into a glass. Chop some fresh basil very finely and mix into the cheese mixture. 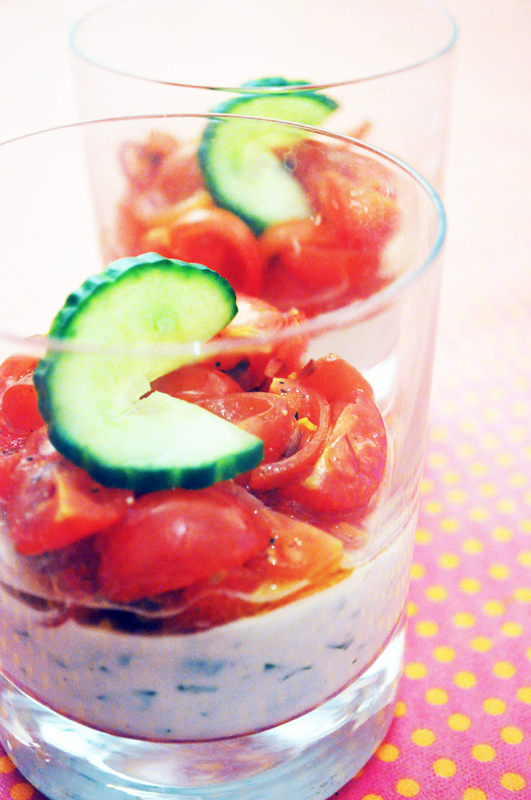 Layer the cheese into a glass, carefully place some tomato salad on top and garnish with a slice of cucumber. Quantities will vary, obviously, depending on how many portions you’re making, the size of glass, the size of tomatoes etc. I think a smallish portion works best, but not so small as an amuse bouche. Any variations? Let us know.